Best Motorcycle Rides along the Blue Ridge Parkway and around Great Smoky Mountains National Park. Our motorcycle trip to West Virginia to explore the mountain back roads. The focus was on the south tip of the state - Coal Country. Saturday, October 20 - started with cold showers in the NC mountains. Morning found Jackie and I droning along I-40 under grey skies and a pelting of rain that came and went in soft waves. Warm and dry with our heated gear, we had a lot of miles to cover. Tonight and tomorrow night we'll be staying at the The Resort at Glade Springs south of Beckly, WV. We started on the highways, hoping for better conditions later in the day. First to Asheville, NC, then north on I-77 to Johnson City, TN, then northeast on I-81 to Bristol, VA. We stopped north of Bristol to top up the tanks and get some hot coffee at a Dunkin' Doughnuts then peeled off the Interstate through Marion, VA to start our ride north on the mountain back roads. VA 16 is familiar turf, "The Back of the Dragon". The well promoted road winds through rocky cuts and long stretches of tight curves north to Tazwell, VA. We've done it before, it's a fun motorcycle ride, one of the classics. The rain tapered off as we entered the hills and it was a decent ride at a wet-road pace. Reaching Tazwell, VA, we needed to arc north to Beckley, WV. VA 16 becomes WV 16 and leads to Beckley - it was the obvious route. We enjoyed nearly every mile of it. While the southern portion in VA gets all the attention, this extensive section north is better. WV 16 winds its way through long wooded valleys and twisty passes between roadside coal towns. It's mostly a wide two lane road with good pavement, generously curvy. The mountains and valleys are seriously rugged, the scenery stunning, especially with the bright fall color that was now lighting up as the sun burned off the clouds. Passing lanes on grades are common letting you leapfrog the industrial traffic this road was built for. WV 16 is one of the best rides in southern WV. It's a major road, you can make good time on it and it's is a good introduction to the area with coal mines, small mining towns, and miles and miles of dramatic rugged mountains. Near the middle of our ride, we dodge off WV 16 onto WV 97 for a while before returning to WV 16 again, a really sweet long stretch of curves we liked. It's common to find the road on one side of a river with railroad tracks running on the parallel shore, long trains of gray rail cars topped in black gold slinking along. Rows of aging roadside company houses cluster near mines and at cross roads. The are few amenities like fast food, motels, stores and shops. Small roadside businesses take care of local needs. Larger towns host the vacant buildings of past industrial prosperity. Traffic is as likely commercial as not, trucks and trailers of equipment moving between sites. You my hit the occasional snag but the chance to pass is usually coming up soon. The interstate highway will take you from Marion to Beckley in less time than WV 16 but it's a longer distance on the main roads. This ride is so good the extra time it takes is worth it to get off the four lane highway and frolic in the turns. While the coal industry chugs along, one new business is surprisingly widespread - ATV rentals, tours, and facilities. We started seeing signs for the extensive Hatfield-McCoy Trail Systems and passing through ATV friendly towns where unlicensed vehicles roam the public roads unhindered. We passed businesses with fleets of the 4 wheeled toys, trucks with trailer loads of them, and witnessed several large groups of riders gathered at trailheads or emerging covered in gray muck. The bulk of the motorcycles I saw were light weight trail bikes, the machines you want for the more extreme trails, but they were vastly outnumbered by the 4 wheeled crowds. What little I saw of the trails was impressive - steep, wet, rocky climbs up from the road, or winding muddy roads full of big puddles. It looks like serious territory. The sun grew low as we cut across a web of GPS generated roads to The Resort at Glade Springs. The golf resort south of Beckley also caters to the public with a restaurant and events on the grounds. Currently, there was a Halloween attraction that was drawing visitors. We got the required passes at the gate then rode a mile or so to check in at the main lodge. It was not quite what I'd expected. I was expecting an all-in-one-place, a room with a walk to dining and a bar. Instead, facilities were spread across the large property. The layout resembled a college campus. Breakfast was in the lodge. Our rooms were in a group of small 4 room buildings a short drive away. The bar and restaurant were a half-mile walk and it was getting cold. We got our exercise staying here. Yermo arrived not long after we did and we walked to the pub to top the evening. Sunday, October 21 - Snow. A strong front moved through overnight. We later learned 60,00 in the area lost power. Breakfast dragged on deciding how to play this day we'd been dealt. Even with heated gear it was pretty darned cold and there was concern for ice. Ultimately we chose to make a visit to a demonstration coal mine in Beckley and take a tour underground. It took a frustrating hour to get a ramshackle cab then another half hour to get to the mine. Then, it was a great experience. The tour starts at the museum and gift shop. We piled into ore cars fitted with seats and the engine drove us into the mine 1500 ft under ground. The train stopped periodically as our tour guide explained the equipment, history, and life of a coal miner along the way. We all enjoyed the experience and came away with a deeper appreciation of the area we were riding through. Returning to the resort with a couple hours of daylight left we suited up and plugged in. Heading south I first led the crew out a road our driver had mentioned as pretty, Mountview Road. It was OK, not a bad way to traverse between larger roads, but not exceptional. We got on VA 3 continuing south. Mountview Road had taken us a dozen or so miles east, I was looking for a way to loop us back west. Coming into Nimitz I spied a small side road and I instinctively I cut right. Chances were high Ellison Ridge Road would be a waste of time, a long run to a dead end, but I went on and so did the single lane country road. It was paved though there were times it was hard to tell. Mile after mile we rode deeper into the hills passing farms and forest always expecting the end of the pavement around the next blind curve. The road was littered with blowdown from the night before, wash from the roadside, and wet areas. We passed under a fallen tree held aloft only by power lines. Crossing a small river the road climbed an endless steep and dirty grade, then coasted gradually down to meet the main road we sought. Ellison Ridge Road was 27 miles of adventure, what a ride! Heading back, we made a short detour to see the local "ski slopes". Nothing but a muddy mess today, then returned to haunt the pub another night. We packed up, bundled up, and plugged in on another chilly morning. Our rooms are waiting tonight at the Chetola Resort in Blowing Rock, NC a few hours south. The bulk of our day is for exploring more of WV, then a run to Blowing Rock passing through Damascus, VA. We turned south for several miles to reach our first new WV back road - Odd Road. Odd Road was a great start. It quickly turned into a tight and twisty romp passing through the town of Odd then rolled on to meet WV 16. It was a lot of fun. We then followed WV 16 to WV 10 diving south to Matoaka. WV 10 is a larger two lane road with generally easy curves. There is a 6 mile section in the middle that is just wonderful, a beautiful section of tight curves and exposed rock walls. Needing gas, we continued on WV 10 for quite a stretch to reach a station. The gas break turned into an entertaining coffee break as 3 locals stopped to talk bikes with us. All had fondly owned BMWs at some point. The sun was out and the day warming. Tanks topped, I led the way back to Matoaka then veered west onto WV 71 - Lorton Lick Road. A small tight winding two lane road, WV 71 was beautiful and an adventure. We passed through a small settlement of close houses then rolled high on a bluff above a small river before we entered a long wooded stretch. The sunshine ignited the fall leaves and they blazed in color above us. We emerged onto US 52. US 52 is a major road and not especially scenic overall. We used it to jump to WV 161. A broad road with no centerline, two white lines mark the edges. It started with nice hairpins, then got slick and wet from the coal trucks from a couple mines along this route. We managed to skirt around one truck but not a second. It wasn't long before it turned off and the rest of the ride was good. WV 161 is a useful road and a decent rides taking the coal trucks into account. One coal road leads to another, WV 161 intersected WV 103 and we turned north again. A bigger road, WV 103 - Riverside Drive carries more traffic. It traces one side of a river with the railroad on the other passing a couple mines on the way to Welch. US 52 came in handy again taking us west to meet WV 80. This section of the main road is more wooded with nice flowing curves. It was well into the afternoon when we turned south on WV 80 for the twisty run flowing into WV 83. When 83 turned west I hopped onto WV 635 to continue due south to WV 638. WV 638 was a nice road for a while then veered off as a smaller unmarked road. It seemed to be petering out. We passed ATV trails and signs ATV's used these roads. Sure enough, miles out in the boondocks the pavement ended. Consulting the GPS I found a possible alternate route and we started backtracking to reach it. WV 636 didn't look much better than WV 635 but it did point in the right direction so off we went. Tiny, twisty, technical and fun, the pavement continued on a true adventure road. WV 636 flowed into slightly larger WV 67 and as we reached Virginia it was time to head for the rooms. We worked our way south crossing the interstate then on to Damascus, Virginia. Shadows were getting long now and it was time to plug the heated gear in again as we whipped south into Tennessee on TN 133. At Shady Valley we turned east on US 421 to enjoy an evening ride on The Snake. It was a nice run, the golden sunlight of the evening making the trees glow. The road was nearly empty this late in the day. Leaving the Snake we passed through Mountain City then entered North Carolina. The congested main roads took us around Boone and on to Blowing Rock. Rolling up to the Chetola Resort I was pleased to find just what I was looking for. It was a beautiful setting, the buildings posh, the warm glow from the pub windows beckoned as we checked in. Just what I wanted after a good day on the road. Tuesday, October 23 - The Parkway of course! You could tell early on it was going to be a nice day and we got off to a good start riding US 221 from Boone to Grandfather Mountain. This section of US 221 clings to the slopes below the Blue Ridge Parkway. It's a fun and technical ride freshly paved in places. We paused for the photo below the Linn Cove Viaduct then enjoyed the rest of US 221 into Linville for fuel. I handed Yermo my keys and we switched bikes. It was quite a transition getting on his BMW R1100s after spending the last few days on my new BMW 1200 GSA. Linking to the Blue Ridge Parkway via tricky little Roseboro Road was a challenge on the unfamiliar ride, but after 20 minutes on the parkway I'd started to get more comfortable with the bike. The fall color was gorgeous as the day warmed. We flicked our way south through the bends enjoying the light mid-week traffic. After an hour or so we stopped and switched bikes again - I stayed on the 1100, Jackie got on my GSA 1200 and Yermo hopped on her 2017 BMW 1200 RT. The day just got better and better. The fall leaves were at peak in places. The air was so clear, you could see forever. We passed up early chances to head for home to keep enjoying the high road and hit all the classic stops. We left the parkway at US 19. It took us through Maggie Valley and home to Waynesville. Our previous explorations in West Virginia have been in the hills and valleys west of the Shenandoah area. This southern tip of the state is more rugged and mountainous. The northern areas are more agricultural and pastoral, this region is both more industrial and and more rural. Coal mining dominates, there is little else. I'd expected to see vast extractive wastelands, and while there are roadside mines, most are out of sight. Instead, the mountains and valleys are ruggedly beautiful, winding rivers link gritty towns, forests dominate. What a variety of roads! The riding here is outstanding. You'll find few sections of four lane, two lane roads of various sizes dominate. The bulk of the roads are in excellent shape, seemingly built to accommodate the commercial traffic to and from the mines. There are many good single lane roads and we strayed on to a few "adventure roads" - paved, but just barely. Off road adventure looks to be the growing industry. The challenge here is the lack of amenities. Towns are small and there is little in them. Next task is to look for the good spots, food, gas stations, and lodging, then explore the roads that link them. Wayne Busch searches out the most entertaining roads in the Blue Ridge Mountains then records them on a series of maps which span the region. There are more great motorcycle roads in the Blue Ridge and Smoky Mountains than anywhere else. I highlight the best roads then show you the best ways to connect them together into rides. More than a decade of searching has discovered more than 1000 good roads to enjoy. We continue to search so you may enjoy. Looking for a more permanent mount for my phone on my new motorcycle I came across the RAM Finger Grip mount. It's a simple clamp to install on the bars and holds the phone securely on all 4 sides. The RAM ball mounts make it easy to reposition it just right. The trickiest part is custom fitting the phone to the mount, made a little more difficult as there were no instructions in the kit. It was easy to find a diagram online. 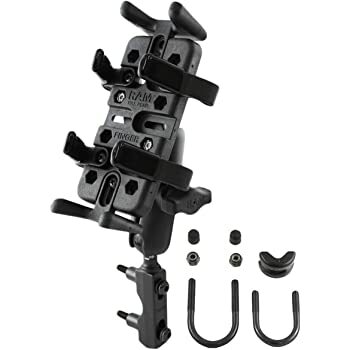 The kit comes with two sizes of top / bottom mounts, and 3 sizes of side clips so you can custom fit it to your device. It's a matter of trial and error to find the correct location so the clips do not fall on buttons on the side of the phone. For my iPhone 8S in an Otter case it took the larger top / bottom clamps and the middle sized side clips. The mount seems very secure, the spring clips are quite robust and have vinyl covers to protect the device. It's solid when clamped in. There are no screw clamps to deal with so it's easy to pop the phone in and out of the mount to take photos. As this mount moved the phone closer in I was able to use existing wire harness clamps to run the accessory USB port so not zip ties were needed - nice and clean. A 6 inch phone cord makes the link to power. Wayne Busch searches out the most entertaining roads in the Blue Ridge Mountains then records them on a series of maps which span the Blue Ridge Mountains. Get this new book! The Art of Riding Smooth by Jim Ford is simply the best work on the techniques of riding in the mountains well. It’s an easy and fun read with simple to understand methods you can learn to become a safer and more confident rider. For more than a decade Jim has been teaching riders the advanced and unique techniques needed to master the challenges Appalachian mountain riding throws at you. He enthusiastically shares some of his best hidden roads and a wealth of info on historic sights, restaurants, favorite places to stay, and little known attractions. This is a great book, you should have it! I am beginning to think Georgia does not want to be mapped. For more than a year now I have been trying to complete the most comprehensive and detailed map of the northeast corner of Georgia's unpaved roads and trails. Things could have gone better at times. I've made tremendous progress, I can see the light at the end of the tunnel, but it's been a costly process. It takes about 2 hours for me to get to heart of the map(s) from my home in western NC. I've both stayed locally in GA and strategically commuted to knock out sections of it. I'm so bored with the ride down and worse yet, the ride back. I think this will be the 5th rear tire on this project. I've had GPS fails requiring replacement and re-riding of the areas, lost a 1 month old iPhone with all my notes and photos, replaced brake pads, sprockets, chain, and had to expand my carrying capacity for all the tools and spare parts I'm coming to need. Today was yet another costly learning experience. I made a judgement error. I'd just replaced my rear tire on the trail bike, a BMW G650 XChallenge with another aggressive off-road tire. It was exactly what I wanted for the job. A week or so after the hurricane followed by a week long rainy spell I expected sloppy and muddy conditions at best. I dropped my rear tire pressure from 29 PSI to 20 PSI, checked the front was holding steady at 16 PSI, I'd had good performance with these settings many times prior. I was ready. I needed an epic day to complete the map, essentially edge-to-edge across both sides of the map. Most of it was expected to be easy forest roads, though I had some difficult parts on the list. I set out early, as soon as there was enough light to see for the long drone south on the highways. This new tire felt odd, but that's not unusual with these knobby tires. Each feels different. They take a bit to scrub in and square off on the road before things settle down to a predictable performance. I reached my 120 mile tank range and stopped for gas. My rear tire overheated from the long run on the highways. The tire was coming apart, melting. It was so hot I could smell it. Half the center knobs were gone, others peeling away from the carcass in shreds. While I'd had no issues running other brands of tires at off-road pressures this one did not tolerate it at all. I stopped, called home to let my wife know to watch my progress on her tracker program as limped home. I aired the tire up and hit the highway with fingers crossed her help would not be needed. I kept to just below the speed limits and made stops to let the tire cool down periodically. I made it home with not much of that tire left. Sadly I pulled the wheel and headed for the dealer to get the tire replaced. Another day lost, another adventure added to the list. Perhaps it is "the hand of providence" telling me to take my time, look harder, there's more to be found, don't rush too early for the finish line. I do keep finding new roads, new trails, places I'd missed earlier or discovered through research. Project Ridemore is sponsored by Smoky Mountain Harley Davidson in Maryville, TN on the north side of Great Smoky Mountains National Park. It's goal is to get folks riding through guided weekly rides. I've seen many of these rides on the Project Ridemore Page on Facebook, they are well promoted, and now that I've met a group riding I can say they are well run. I got an early morning Facebook message from Tom Ronn who leads these fun rides in the Smoky Mountains. The Wednesday group was stopping for lunch at Caffe' Rel in Franklin, NC. Let's meet. Caffe Rel is a unique experience. It's built into the side of a big modern gas station, an unusual place to find great food. They do not take reservations. There is no waiting area save a few benches outside. There's usually a line. It's that good. The group rolled in on time and I met Tim. There were about a dozen riders enjoying this nice day. I didn't get to meet but a few of them as we were spread amongst several small tables. Two of the riders at our table were down from St. Louis, I believe the remainder were more local. It looked like everyone was having a good time. After lunch, the group was headed to see the nearby waterfalls on NC 28. I ran ahead to get photos of them. They came up on me quicker than expected and I botched the job. The group stopped at Dry Falls, then rode on to get the classic photo of the bikes under Bridal Veil Falls. Here they started back west while I headed east for home. I've been watching Project Ridemore on Facebook. They have numerous well attended rides. They pick unique destinations to visit. My impression is they are well run. It didn't take long once the approach road was paved for this Georgia scenic attraction in Hiawassee to get noticed. Bell Mountain is a rocky outcropping overlooking Lake Chatuge in Hiawasse, Georgia. I've read that it is the scars and remnants of a somewhat sketchy and ultimately failed mining effort in 1963. It's reported a local resident bought Bell Mountain to protect it from further abuse then gave it to the town when he died. The town turned a local eyesore into an attraction. Some find this painting an insult. I find it unique and quirky. The views from the boardwalks at the top of the stairs are grand, it's worth the effort to go up. It takes less than 10 minutes to ride from US 76 in Hiawassee to the top of the mountain. Shake Rag Road starts off curvy then gets very steep, narrow, and tight. Only one car can pass at a time in places, be alert. Bell Mountain is a nice place to take a break on a ride passing through Hiawassee. The views that overlook the town, Lake Chatuge, and the surrounding mountains are some of the best you'll find in Georgia. It's too easy to ride past two great Blue Ridge Parkway attractions at Roanoke - Mill Mountain and Roanoke Mountain. Both are just south of the city and worth a visit. The Park Service roads which lead to them are well marked. Roanoke Mountain Loop Road at Milepost 120.3 is on the east side of the parkway. The 3.75 mile single lane one-way paved road winds up then down the mountain to reconnect with the Blue Ridge Parkway. There is an overlook at the top of the mountain but the better view is from the Mill Mountain Overlook on the climb up. It takes about 20 minutes to ride it though I always stop at the overlook. Mill Mountain is home to the famous Roanoke Star which looms above the city. You reach it via the Mill Mountain Parkway at Milepost 120.5. Mill Mountain Parkway is virtually identical to riding the Blue Ridge Parkway, gently curving and climbing to the spur road (Mill Mountain Spur, Prospect Rd SE) that leads to the park at the top. Just walk around the corner from the parking lot and you stand beneath the largest star in the world overlooking the city below. A zoo, gardens, and visitor center are nearby. It takes about 10 minutes to ride from the parkway to the star. Beyond the spur road, Mill Mountain Parkway becomes JP Fishburn Parkway leading into the city. Both of these attractions offer better views than you'll find from the parkway as well as a unique experience. Great Motorcycle Rides - Is it a Waterfall or Not? NC 28 / US 64 between Franklin and Highlands, North Carolina is well known for it's 4 beautiful roadside waterfalls. Few notice there is a 5th waterfall, at least that's what the sign says. Sequoyah Falls is located just outside Highlands. Truth is it's not a natural waterfall, rather the spillover from the dam on Lake Sequoyah. There's an unpaved pull off, a sign and a plaque here and it does make a nice place for a stop on your motorcycle ride. This is section of NC 28 / US 64 is known as "The Waterfall Ride". The Cullasaja Gorge lies between Franklin and Highlands and has 4 of the best known roadside waterfalls. Expect traffic on this road as it's also the main east-west route through the area. Is it a waterfall? You decide while you savor this beautiful spot on your motorcycle tour of the Blue Ridge. Enjoy! Got questions about this ride or others great roads in the Blue Ridge? - Ask Below! How do motorcycle riders choose from more than 100 outstanding biker roads in the Smoky Mountains? Hands down this should be at the top of your list. The best 50 miles of the 469 mile long scenic road are right here and easy to get to. It's the highest section of the parkway filled with stunning overlooks as it cuts along the tops of the mile high mountains. Ride the section between US 19 (near Maggie Valley) to US 276 (south of Waynesville). Highlights on this stretch include Waterrock Knob, The Highest Point (classic photo with the sign), the Devils Courthouse, Looking Glass Rock, Second Falls at Graveyard Fields, and so many beautiful viewpoints to enjoy. The grades are gentle, the curves are satisfying. It's a relaxing and enjoyable ride. You can do it in a couple of hours or spend the time to stop and savor the sights. If you want to make a day of it, follow the parkway to Great Smoky Mountains National Park and ride across the heart of it on US 441. In the other direction the parkway leads through Asheville then gradually climbs to reach Mt. Mitchell State Park, the highest peak in the east. Located on the west side of Great Smoky Mountains National Park, these roads are two of the most popular rides in the Blue Ridge. The legendary Dragon (US 129) draws motorcycle and car enthusiasts to the 13 miles of tight, technical, challenging curves that hug the border of the park. It can get crowded on weekends and while the road has a notorious reputation a casual run is a lot of fun. You'll see numerous photographers along the route to capture your vacation shots as you pass. Nearly 100 paved pull-offs let you escape the speed demons on your tail or just pause to watch the carnival. It takes about half an hour to run the Dragon. The Cherohala Skyway is very much like the Blue Ridge Parkway running 50 miles between the small towns at either end. It climbs to the highest ridges as it courses through the vast wilderness of the Cherokee and Nantahala National Forests. There are numerous nice overlooks to appreciate the views. The curves are more sweeping, the grades easy, and it's rarely anything you'd call crowded. There are some tighter sections of road as you come off the Skyway at the North Carolina end to choose from. At the Tennessee end of the ride, look for tiny River Road to lead you out to Bald River Falls and Baby Falls. Plan a couple hours for this road if you go out to the falls. To make a day of it a popular loop ride combines both passing the Vonore, TN. In NC, US 129 is an easy ride south to Robbinsville, or NC 28 takes you on an awesome curvy ride when headed east. There are many versions of this ride which is anchored to the section on NC 28 / US 64 between Franklin and Highlands, NC. Cullasaja Falls, Dry Falls, Quarry Falls, and Bridal Veil Falls are found in the Cullasaja Gorge making this one of the easiest spots to see a lot of falls in a short distance. West of Franklin, Wayah Road climbs over the mountains to the Nantahala Gorge. Upper Nantahala Falls is on the way. Wesser Falls and Nantahala Falls are found in the Gorge. To the east of Highlands, Toxaway Falls is on US 64, Whitewater Falls is just a few miles south. A bit further east you'll find Birdrock Falls and Mill Shoals Falls on NC 215, and Looking Glass Falls and Sliding Rock on US 276. There are so many waterfalls you can take a couple days to see all the easy ones. This map shows one way to see a dozen falls in a day on a reasonable length ride. There are many other ways to link the roads and tour the cascades. This easy to access ride on the east side of Great Smoky Mountains National Park is a gem. The 37 mile run from Junaluska to Hot Springs gives you a little bit of everything in nicely spaced doses. There are gentle valley rides, twisty mountain climbs, pretty scenery, rushing rivers, and historic sights. There are a couple spots to eat in Hot Springs and a spa where you can soak in the natural hot spring waters. The ride takes about an hour. There is a popular loop that can make it a half day ride passing through Marshall then winding over the mountains to return back to NC 209. This ride has a few versions which are all built off two outstanding roads - US 276 and NC 215. Both of these roads run north to south. The Copperhead Loops are made with roads which run between them. Think triangle, not loop - US 276 and NC 215 meet in Bethel, NC. They then both run south more or less parallel to one another crossing the border into South Carolina. US 276 is the better known of the two roads. From Bethel, it runs along a valley then makes a dramatic climb to intersect the Blue Ridge Parkway. South of the parkway it descends to Brevard with attractions and waterfalls along the way. It then runs into town then shoots south again passing Connestee Falls into South Carolina. It has engaging curves, nice scenery, one of the most popular waterfalls (Looking Glass Falls) , and can get a bit crowded on weekends as so many flock to the beautiful area around the waterfalls. NC 215 also leaves Bethel to follow a valley, then begins a gradual and twisty climb. It's more technical than US 276 and the challenges are more sustained. There's little if any traffic. There are waterfalls along the way. Both roads reach their first connection at the Blue Ridge Parkway then drop down the south slopes to reach US 64. US links between Rosman and Brevard, it's the classic easy connecting route, the "standard" loop. South of US 64, NC 215 becomes US 178. Both it and US 276 continue south into South Carolina to reach the southernmost linking road, SC 11.